Nikkan Kogyo Shimbun, "The Business & Technology Daily News" and the second largest business daily in Japan with over 90 years of history, recently published an editorial to introduce and support the idea and activities of the Kira Institute. Virtual World is no longer a gamer’s monopoly. Recent development shows that the use of virtual worlds is spreading to the communities in scientific and educational fields. One such example is the Kira Institute in the USA. It had organized various workshops and summer schools in real life, aiming to be a hub of exploring interdisciplinary human knowledge. 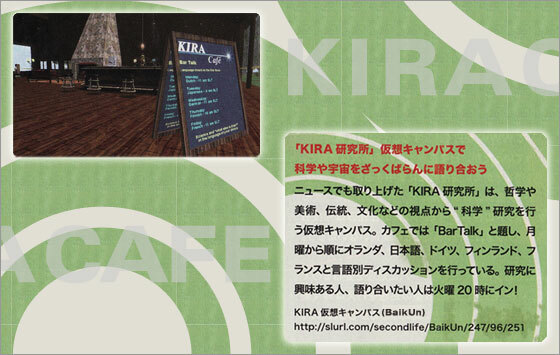 In 2008 it brought its activities into the 3D virtual world, Second Life, and set up the Kira Campus there. It opened a Japanese branch, Kira Japan as well. The Kira Institute is a science and philosophy research institute originally set up in 1997 by Piet Hut, Professor of Astrophysics and Director of Interdisciplinary Studies at the Institute for Advanced Study in Princeton, Roger Shepard, Professor of Cognitive Science at Stanford University, and other members. The institute is now promoting communication among scientists and/or general public at the Café located in the virtual Kira Campus, and conducting collaborative researches and providing education at the Science Park. It is known to be one of the most active Second Life sites in the USA. With its motto, “Science in Context”, the Kira Institute has been promoting intercommunion of natural science and social science or other disciplines. Eiko Ikegami, Kira Japan Representative, Professor and Chair of the Sociology Department at the New School for Social Research in New York, says, “It aims to investigate science in plural and critical ways and re-capture it in relation to the wisdom and insights of other disciplines and world traditions”. Today, we have an increasing number of problems that require us to tackle them by going beyond a single discipline in any single country. These problems include global warming and life science, and they are asking a society at large to identify the problems as such and give thoughts to them. Yet, boundaries still remain static between disciplines in academic arenas, even though interdisciplinary programs are so much hailed in recent years. In a virtual world, however, there is no distinction between professionals and amateurs. It is a barrier free world where one’s nationality, occupation or social status doesn’t really matter. Persons who can’t move because of their physical disabilities can take part in it too. It allows you to jump into academic discussions with the “playful” mind. Inspiring ideas and tip-offs for researchers may come out, which are not available if researchers remain in a narrowly defined academic framework. For the general public, they may raise the level of science literacy if they can communicate with scientists. The 3D virtual world is still being developed and it has many technical and institutional issues to solve. Yet, the 3D virtual world surely presents a great potential to make a breakthrough, if not single-handedly, in the way the scientific community serves in today’s ever complicated life and in its relations with the general public. For that reason, the Kira Institute deserves our close attention, and we would like to see how it develops. 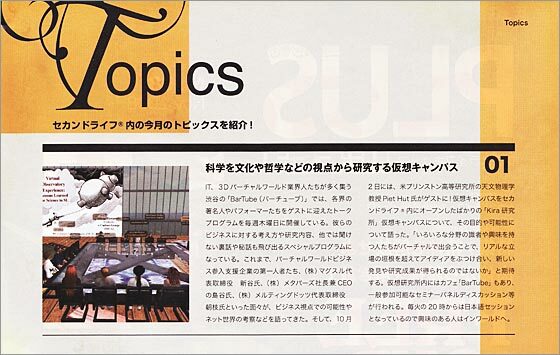 The Kira Institute and Kira Cafe are introduced in a magazine, Plus Life Cube in November 2008. Several writers have also introduced talks and discussions made at Kira Cafe Japan in their blogs (see links). COM LAB is a virtual research institute in Second Life set up by Dr. Jonson on February 23, 2008. It envisions an open/accessible world accomplished by SL residents, whom draw upon their experiences in the virtual world to bridge between virtual and real worlds and transform real life society.. Along this line, we have offered various forms of support to individuals, groups, special organizations, and corporations who carry out activities of a social nature. We also maintain a blog, "COM LAB Activity Blog by Research Associates" through which we aim to promote recognition and understanding of SL in the world. See http://comlabjp.blogspot.com/ *COM LAB is a virtual research institute in SL. It does not exist in a real world.